Does your student need help with his or her college essays? 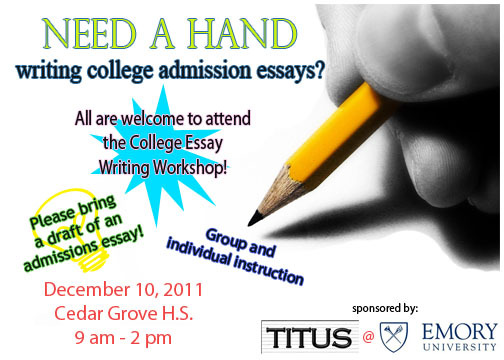 TITUS will be hosting a college essay writing workshop open to all students. Students will receive group and individual instruction and should bring a draft of an admissions essay they’ve already written. Our goal is for every student to leave the workshop with a essay ready to be sent off to prospective colleges and universities. The workshop will be held December 10, 2011 at Cedar Grove High School from 9:00 am until 2:00 pm. If you have any questions, please leave them in the comment section below.